Trump began playing World of Warcraft 10 years ago in vanilla WoW. He played a Holy priest. He led raids and completed Naxxramas up to the 4 Horsemen. After a brief break, he did Ulduar with a Restoration Druid. He is back to raid in Warlords of Draenor . What class does Trump play? What’s his ilvl? 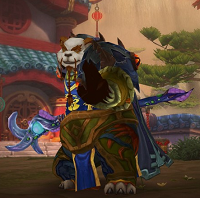 Trump plays a Pandaren Mistweaver Monk. Details on Trump’s character, including ilvl can be found here. What server does Trump play on? What guild is Trump in? Trump is in Amnesty. Trump joined Amnesty because his friends are in it. Why did Trump choose to play a monk? Trump believes in choosing the role which is least represented. The guild that he joined before he started his character did not have many/any mistweaver monks. He enjoys the healing style. What addons does Trump use? As of March 8, Trump uses Skada, Deadly Boss Mods, Weak Auras, and Master Plan. His raid frames are the Default UI. No, Trump is playing just PvE. He feels like he doesn’t have the time to dedicate to playing PvP, in addition to his other obligations. What does Trump think of having a WoW item named after him? Trump is very happy World of Warcraft has included his name in flavor text on the Autographed Hearthstone Card! That’s value! What does Trump think of Warlords of Draenor? Trump thinks Warlords of Draenor is an excellent expansion and he’s having a lot of fun with it. His guild typically raids on Sunday, Thursday and Friday at 7pm Pacific.